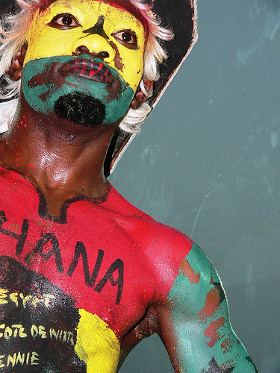 The African Cup of Nations, Africa’s biennial soccer competition, is almost upon us. AS OF THIS writing, there are two days until the starting whistle. More people than ever will be tuning in to this Cup of Nations, looking to size up the African participants of the upcoming World Cup. Since the first tournament in 1957, in which only Egypt, Sudan, and Ethiopia competed, the CAN has expanded to include 16 teams, drawn from the 52 nations that make up Africa. The CAN has made men of current African soccer stars like Michael Essien, Samuel Eto’o, and Didier Drogba, and it’s history is rife with legendary goal scorers such as Roger Milla from Cameroon, the Ivorian Laurent Pokou, and Rashid Yekini from Nigeria. For the first time in its history, the CAN championship will be hosted by a Portuguese-speaking country, Angola . 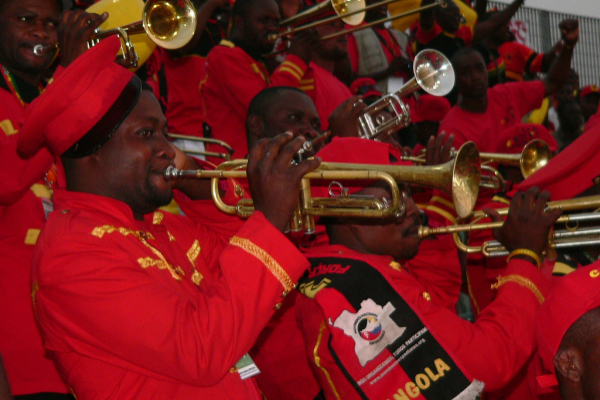 The responsibilities of hosting the tournament have spurred the Angolan government into investing furiously in its tourism infrastructure, and the years following the announcement of Angola as host have been a flurry of development projects, including road rehabilitation, airport upgrades, and hotel construction in the four host cities, Luanda, Benguela, Cabinda, and Lubango. Nonetheless, prices for hotels and restaurants remain outrageous, and critics of the tournament here in Angola contend that the millions of dollars preparing for the tournament could have been better spent elsewhere. Too much too soon, they claim. 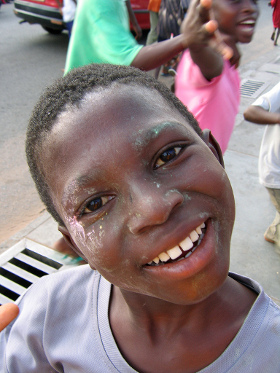 In Luanda, Angola’s capital city, the CAN is the topic of the hour. The streets are awash in an explosion of color and CAN paraphernalia. For once, the usually dusty, trash-filled streets are being swept, and roads are being repaved. The bustling, coastal city, originally built for several hundred thousand and now the home of 5 million souls, will host the home nation, Algeria, Malawi, and Mali. All games will be played in the Estádio 11 de Novembro, named after Angola’s Independence Day and built from the ground up in about 17 months. The stadium is the grand jewel of the competition and will host the opening ceremony, the opener, and the final. Most pundits predict that Angola and Mali are the favorites for this group, although World Cup participants Algeria are sure to put up a fierce fight. The Cabindans like to say that all of Angola’s newfound oil money comes from their province, and they are basically right. A substantial amount of Angola’s oil wealth comes from the country’s northernmost province, which is separated from the rest of the territory by a stubborn strip of land belonging to the Democratic Republic of the Congo. The province enjoys its football and regularly has a team playing in Angola’s national first division, the Girabola. Cote d’Ivoire, Ghana, Togo, and Burkina Faso are all based in this city and will be playing their football at the Estádio Nacional do Chiazi. 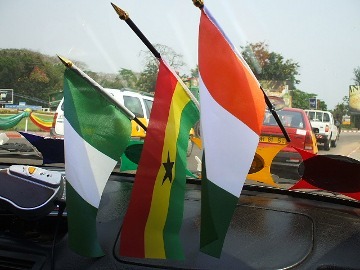 Many pundits are calling this the Group of Death, and the Cote d’Ivoire vs. Ghana encounter is one of the most anticipated battles of the tournament and is likely to sell out the 20,000 seat stadium. Appropriately, these are the two teams most likely to qualify from this group. Benguela, nicknamed “City of the Red Acacia Trees”, is Angola’s second most important trading point, its cultural center, and, according to most Angolan guys, the city where all the pretty girls come from. Several of Angola’s most prominent football stars have come from Benguela, including its all-time leading scorer and former captain, Akwá. Benguela will host Mozambique, defending champions Egypt, Nigeria, and Benin. The matches will be played on the brand new Estádio Nacional de Ombaka, located well away from the city center, in the Nossa Senhora de Graça neighborhood. Matches like Nigeria vs. Egypt are sure to be captivating. Every time I go to Benguela I think it’s my favorite city in Angola. Then I go to Lubango and I question everything. Of all the host cities of this competition, Lubango is the cleanest, and has perhaps the most idyllic setting, due to its high altitude, its canyons, and its moderate climate. The average temperature is about 70 degrees Fahrenheit, perfect for soccer. Visitors might be reminded of Rio de Janeiro because of Lubango’s very own Christ the Redemeer statue, standing guard over one of the only provincial capitals in Angola that wasn’t directly ravaged by the war. Cameroon, Gabon, Zambia, and Tunisia will be playing their games at Lubango’s Estádio Nacional da Tundavala, named after a canyon on the outskirts of the city that offers spectacular views of the surrounding countryside. Due to their pedigree in this competition, Cameroon and Tunisia are favorites to go through. Most soccer fans, myself included, agree that Cote d’Ivoire will not go down lightly: I’m betting we’ll see Didier Drogba lift the trophy in Luanda on January 31st. Nonetheless, soccer fans are all hopeful of an exciting tournament with many goals and fierce rivalries. Here in Angola, the jubilation is palpable. The fact that the nation is hosting anything at all less than a decade after the end of the civil war, not to mention building four new stadiums in the process, is cause for intense celebration. Lusaka Sunrise is working to fight the spread of AIDS through the power of soccer learn more in Brave New Traveler’s article on the organization.